There’s no rhyme or reason for these Five Faves, friends. I know many of you out there are at the Walk for Life in D.C. (or wishing you were there or praying, as I am here, for all of the babies aborted since Roe v. Wade), but this post has (almost) nothing to do with abortion or the Walk for Life. I decided that I needed a little pick-me-up, so I’m trying to focus on a few things that have brought me joy in the past couple of weeks. I know I said nothing to do with the Walk, but I always love reading this post by Maggie. This year, my Little Man’s name made the list and it makes the whole thing more real for me than before. You know you’re an adult when you get excited about buying a mop and some new cleaning solution. Yesterday, I got both. I haven’t gotten into the whole natural/green/dyi cleaning solution craze, but someone on the Internet (so it must be true, right?) that I could use this multi-purpose solution on my kitchen floor (laminate) AND my hardwood floors. Gasp! So, I went to my local store and smelled all of their different flavors (which were DELICIOUS) and chose the lavender scent. I used it last night in the kitchen and early today in the living room and I’ll agree that this works great! Excited to try some of their other scents at some point too! I know I promised that I would devote a whole post to this, but I also know that there’s no way that I’m going to have time for that in the near future. So, the book gets the bump here! For those of you who are Catholic moms, you’re going to love this book. 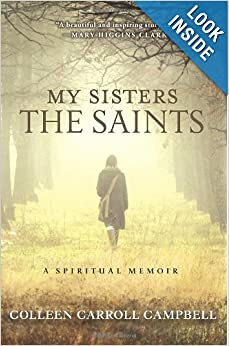 Campbell weaves her own personal story with her discovery of different female saints and how their paths relate to hers. One of the things I really liked about it is that she switches back and forth between herself and the saints pretty seamlessly and she spends a good amount of time on both. As a young Catholic, I can relate to her personal story in many ways. The saints she chose (you’re going to have to read to find out who!) are ones that I knew a little bit about, but I was pleasantly surprised but how much I learned. Altogether, it’s an enjoyable read, and I highly recommend it. I’m gradually starting to sense a bit of a theme here. But, seriously, you can spend some serious time on this YouTube channel. There are videos on how to clean just about anything! While I haven’t tried all of them (okay, or any of them), it’s fun to watch and she makes everything seem so simple! Click on the photo for the link. Sorry, I couldn’t make it bigger for some reason and I’m WAY too tired to try one more time. I pretty much have no opinions whatsoever about Pharrell, but this song makes me want to dance. Turn it on, clap along, and have a mini dance party! When you’re done dancing, head on over to Moxie Wife and check out the other Five Faves! so glad to add the little man!! !